Stef and Adam of Fox 21 News from Duluth, MN came and visited us in our last week of production of the 2014/15 season. 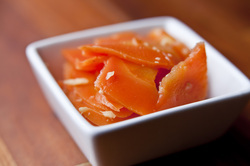 Check out a short interview with us and see the ginger carrots being jarred up. Zorba Paster on Your Health with Tom Clark did a taste test of our krauts on their most recent show. On another show Zorba has stated that kraut didn't contain health benefits other than Vitamin C. Andrew followed up with a long email to him and the show producer and we sent them a sample pack. They proceeded to make a correction on their show and tasted a number of our krauts on the air. Tom was not a kraut lover and when Zorba had him taste the Mustard Kraut he took multiple bites! ​Listen to the show, the part where they address the benefits of lacto-fermented veggies is a 30 minutes. Air date Dec. 20, 2014. We made the front page of our local Ashland, WI newspaper, The Daily Press on October 31, 2014. A new book called ﻿﻿Fermented Vegetables by Kirsten and Christopher Shockey has just been published. Kirsten was so kind to include us in the book. She gives a great explanation on the health benefits of fermented veggies. Fall 2013 Issue of Living the Country Life Magazine.